I want to share a script that came about after i wanted to get hold of all the WMI-queries that’s been created and used for populating different device collections without need to go in to every single one of them and extract the query manually. Especially if you are dealing with larger environments who might have hundreds of device collections and first of all figuring out which one actually uses WMI-queries and who doesn’t. 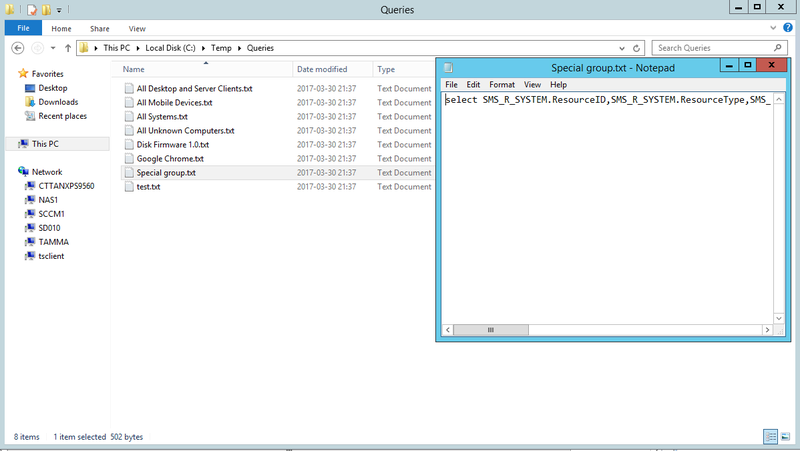 Extracts all the WMI-queries used in SCCM and outputs them in to a .txt files for each Device Collection. $SitePath = $SiteCode + ":"
$CollectionMR = Get-CMDeviceCollectionQueryMembershipRule -CollectionName "$Devicecollection"
When the script is finished go to your destination folder and you will find the all the different device collections and their WMI queries.